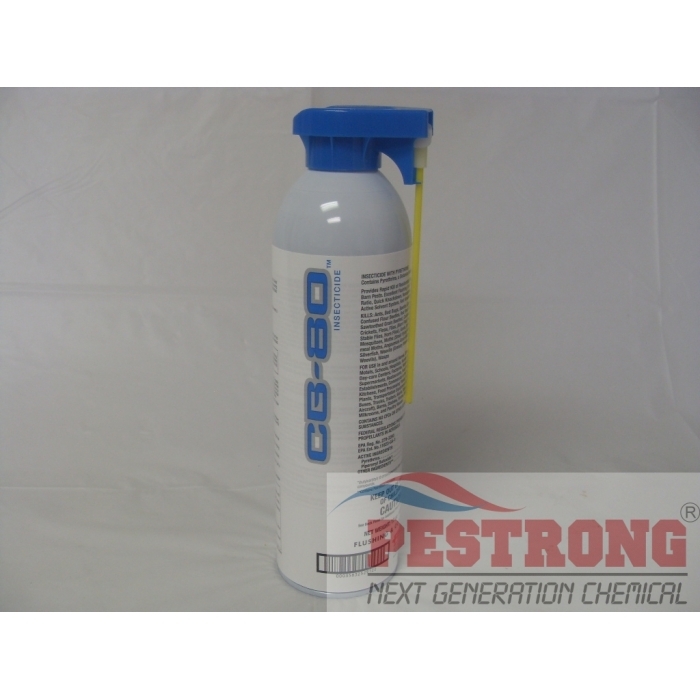 Where to Buy CB-80 Insecticide, CB-80 Flushing Aerosol Insecticide - 17 oz - $23.25 for Sale with Fast Free Shipping! CB-80 Flushing Aerosol Insecticide - 17 oz is more quickly knock down than CB-40 because 4% PBO. The industry’s best-selling flushing and contact insecticide. With its ideal 8:1 synergist to Pyrethrin ratio, CB-80 has earned an outstanding reputation for ultra-fast knockdown and kill of cockroaches and over 20 other pests. Ideal as a space or crack and crevice spray, CB-80 boasts a broad list of use areas, including restaurants and other food-handling establishments, meat packing and food processing plants, food storage areas, hospitals, supermarkets, motels and hotels, residences, utilities and transportation equipments. CB-80 is acetone-free, compliant with all current VOC standards and contains no ozone-depleting substances. The propellant and solvent have been designed to dissipate harmlessly in the air, eliminating the concern for ozone damage. Furthermore, CB-80 can be applied around electrical junction boxes. So, CB-80 is more quickly knock down than CB-40. CB-80 now labeled for interior and/or exterior uses both. CB-80 is the best knockdown i've used for many years now. Works where ever I spray it. So glad that I found Pestrong. Shipping is really fast!! good product, but hard to find at local store.